Any game where players are each DRAGONS has to be a fun game! Every dragon needs a cave full of treasure. Also, any fierce dragon needs to flame down some little cute cottages, avoid knights, and capture a princess. Winning DragonFlame takes exactly that - the best loot and destruction. I have enjoyed about a dozen plays of the game so far, and I plan on playing DragonFlame many times more. Matt Loomis, a first time designer, has made a great game. The game is very compact in size, but lots of interesting decisions to be made. Each round players are dealt a hand of cards. 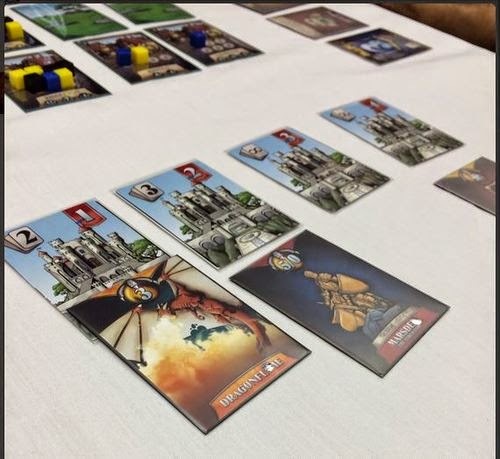 Players go in turn order, loading each of the castles with interesting loot (some good, some bad). The twist, some cards are placed face-up, while others are placed facedown. Its the classic mechanic of cutting the cake, but each player has partial knowledge of which castle has good loot. Also, because of the unique and interesting set collection scoring, sometimes one man's junk is another man's treasure. After each castle has been loaded with loot, each player steals the treasures from a castle. Most cards are straight forward, worth positive or negative points. Some of the set collection scoring is neat, with things like statues only scoring if they are unique, while treasure chests being most valuable if you collect like kinds. However, not all treasures are helpful. For example, players must deal with nasty knights and cursed treasure. In general, the set collection is clever, but the game does require some initial teaching time to get all players clear on scoring. The real thematic heart of this game is found in the DragonFlame cards. 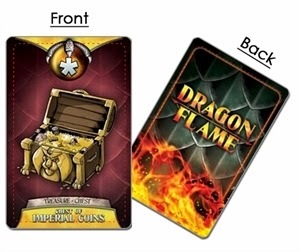 Not only can players acquire loot, but also in the mix of cards, players can also acquire DragonFlame cards with strength value of "1", "2", & "3". These cards are used to burn down the village cards. 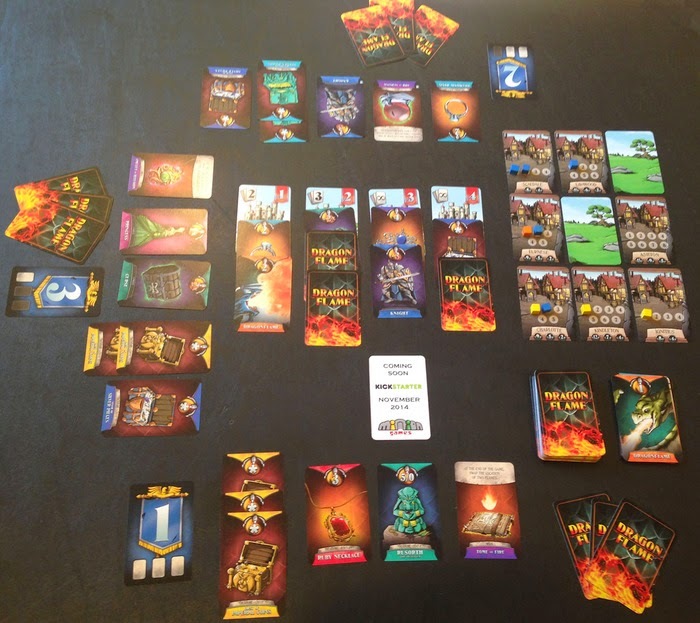 Players use their DragonFlame cards to fly over the city cards (arranged in a 3x3 grid) and destroy the towns. I did mention each player is a dragon. It only seems appropriate that we get to fly over little villages and burn them down. Each village features some area control scoring and is awarded to the dragon(s) who contributed most to the destruction. Overall, I find the game is like 3 mini games working together. The first is a fun twist of cut the cake, dividing treasures amongst the castles. The second game is area control, with flames on the villages. The third game is the treasure set collection. 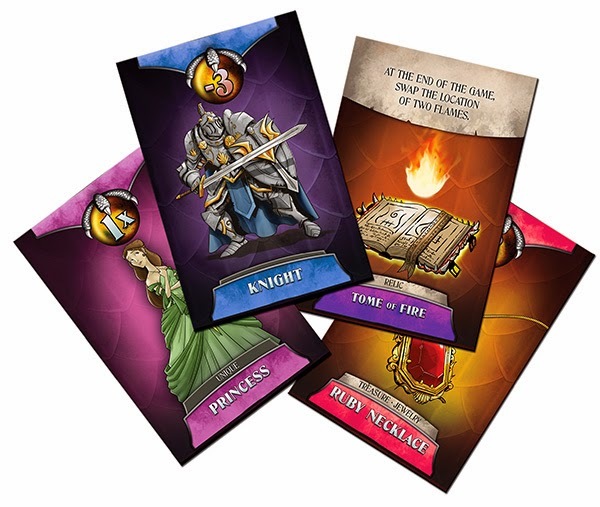 Each experience weaves together interesting decisions, creating a great 30 minute card game. 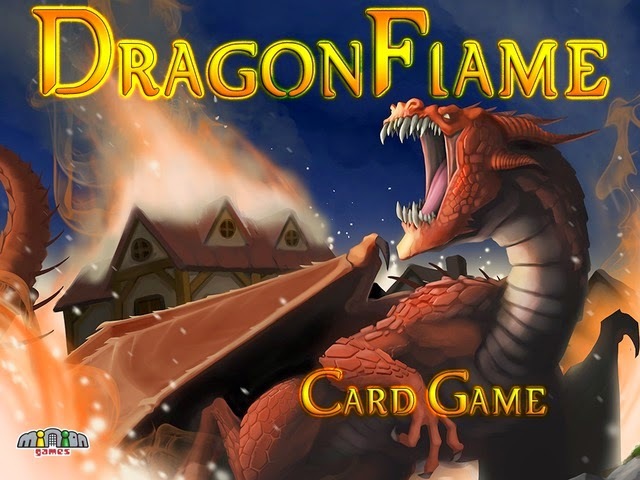 DragonFlame might be small on price but packs a dragon size amount of fun. If you're in the Toronto area this weekend and find yourself attending the massive FanExpo convention downtown, make sure you stop in and say hello. On Friday, my co-blogger Daryl and I will be volunteering at the Z-Man Games section in the board game room 718. I'll be helping to teach Pandemic and the adorable and violent Krosmaster Arena. 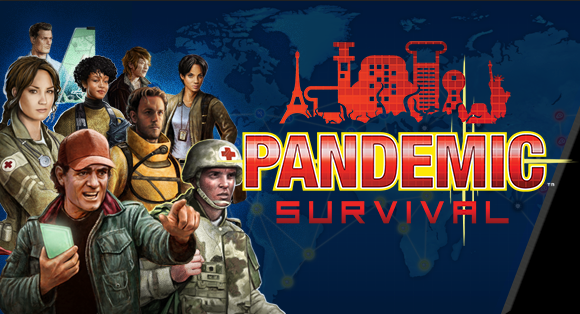 And if you're around Friday night or Saturday afternoon, you should definitely sign up for the Pandemic: Survival competition. Multiple players playing the exact same game - card order, etc. Basically Pandemic played like Duplicate Bridge. What an awesome idea. The rest of the weekend I'll be manning the My Pet Skeleton booth in artist alley so come say hello and check out some of my hubby's amazing artwork. Or even sign your butts up for the Great Canadian Board Game Blitz with my friend Ray on Sunday afternoon if you're looking for something to do. It's running across the street from the convention centre at the Royal York Hotel. So many options!!!! !